Kashmiri dum Aloo is one of the famous dishes of Kashmir. It is served at family functions or parties. People also make it during festivals in Kashmir. There are many historical refrences for this dish. 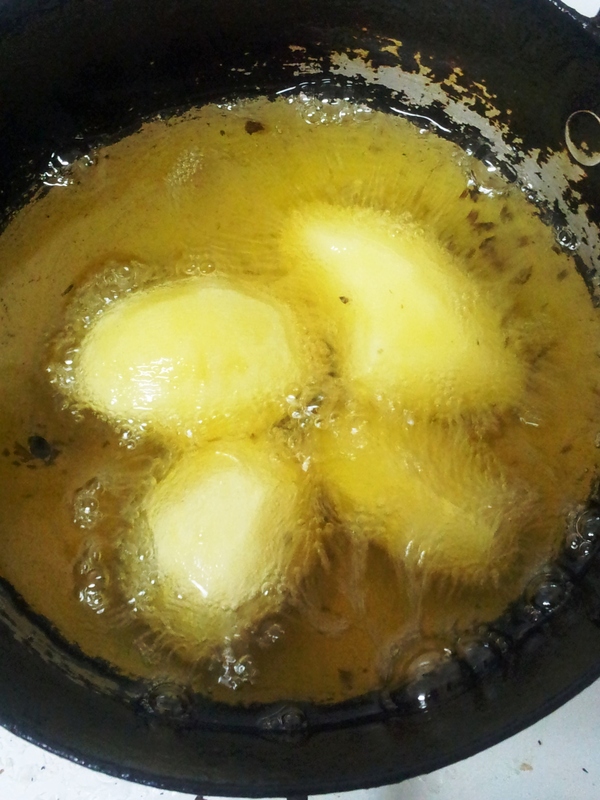 Its main ingredients are small sized potatoes and yogurt (dahi or curd). 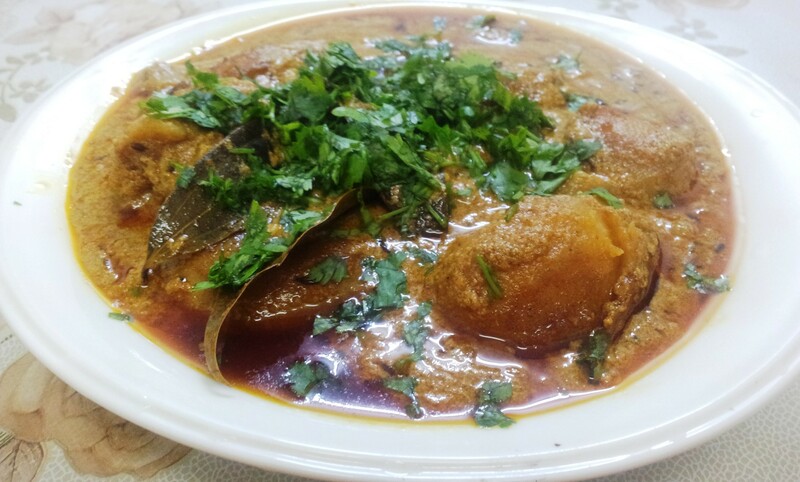 Kashmiri dum aloo is prepared by deep frying the small-sized potatoes, later on it is cooked with yogurt curry and spices like saunf (fennel), zeera (cumin), and other aromatic spices. When I had cooked this super delicious and palatable dish, I had got a lot of praise and appreciation. 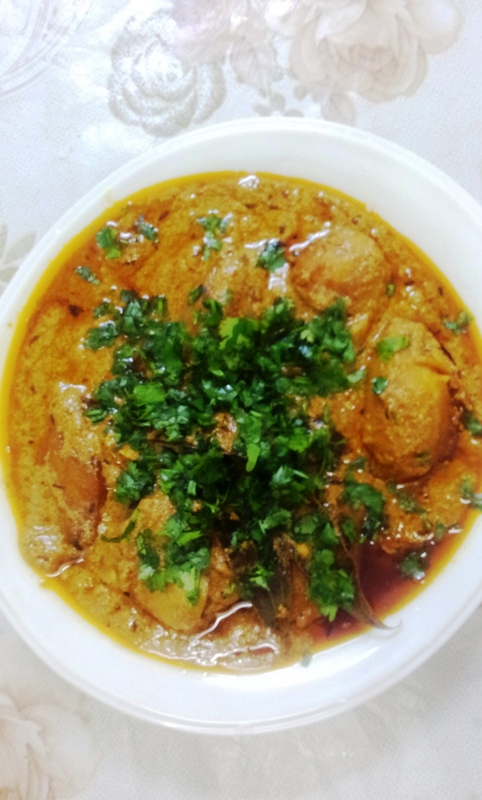 I have tried out my best to give you a perfect and authentic dish of Kashmiri Dum Aloo. Still if you find something is missing let me know, I’ll surely do the additions; only after making the kashmiri dum aloo with the recipe at home. Its taste is sour, tangy and little spicy. Yes, this dum aloo is not too much spicy as I had used kashmiri red chilli powder in the recipe. It’s entirely up to you; if you want to spice up your food, add red chilli. But do not ever think of replacing Kashmiri chilli with the red one. You can put both for that extra zing. If you have guests at home, cook this simple, sour,tangy and impressive Kashmiri dum aloo with the given recipe. This Kashmiri dum aloo recipe is very easy to cook. You can have this Kashmiri dum Aloo with puris, butter naans or fried rice. Servings 4; time taken – 40 minutes. 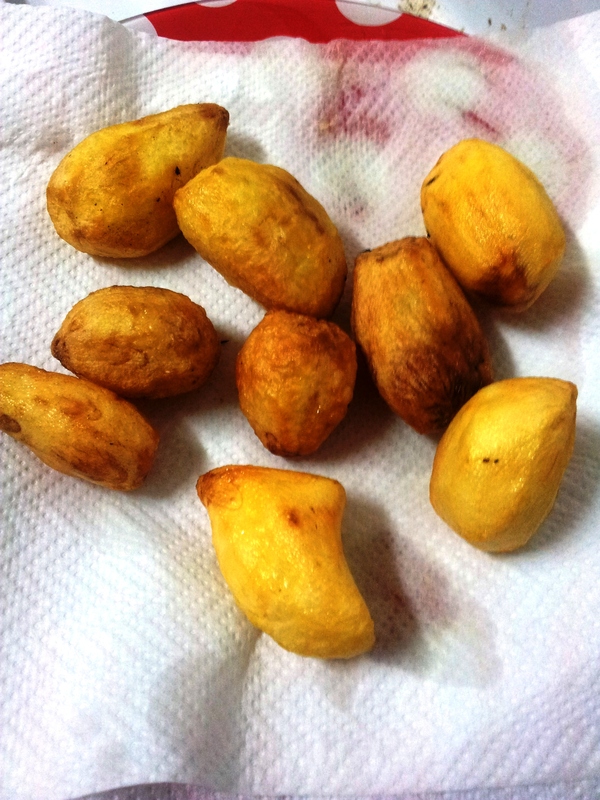 Peel the potatoes, wash and dry them. In a wok, heat refined oil for deep frying. Now deep fry the potatoes on medium flame until they become golden. Let the potatoes cool. Once they cool down, take a toothpick or fork start playing with potatoes! Kidding! Just take a toothpick or a fork and prick the potatoes. Keep aside. Take yogurt in a bowl and beat well, in a creamy consistency. Don’t beat it in a hurry; stay calm and beat beat beat the yogurt nicely. 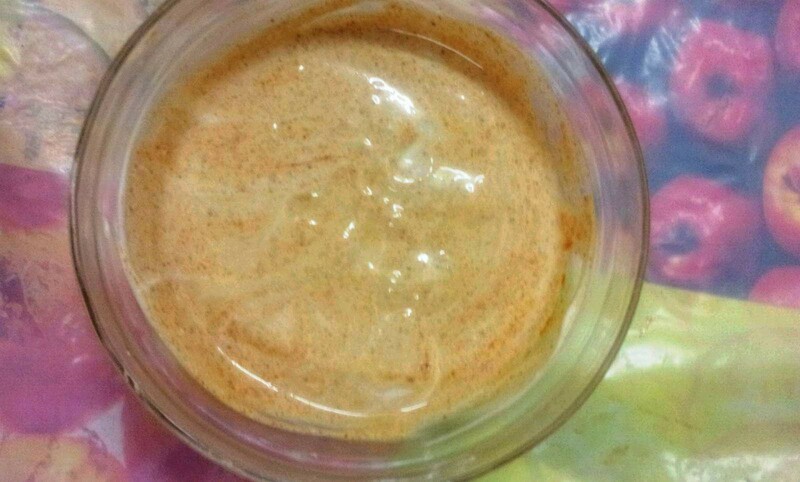 Beat yougurt and mix the spices in it. Now, add all powdered ingredients to the yogurt bowl – coriander powder, cumin powder, mango powder, fennel (saunf) powder, All spice powder, green cardamom powder, dry fruits powder, kashmiri red chilly powder and ginger-garlic paste. TING TING, mix everything nicely. In another wok or cooking pan, heat 1 tbsp refined oil. Add cumin seeds, cloves, black cardamom, bay leaves and asafoetida (hing) . Fry them for a minute. Add turmeric (haldi) powder and saute well. Lower the flame. Add the yogurt mixture and keep stirring for a minute. Add salt. Mix well. Add the pricked potatoes to the yogurt gravy and mix well. Cook further for five minutes. Your super duper sour, tangy and spicy Kashmiri dum aloo is ready to be served. Now transfer in a serving dish. Serve finger-licking Kashmiri dum aloo HOT with naans or fried rice. If you want Kashmiri Dum Aloo spicy add red chilly powder. Stir fast when you add yogurt mixture in the cooking pan to avoid coagulation. Previous Post: Fried Ice Cream,Open Faced Burger, Red Velvet Muffins – A Lavish Breakfast in Bed! Reblogged this on Hungry kya? let's cook Veggie Indian Snacks . Thanks Naman… glad you liked it and we appreciate you reblogged Kashmiri Dum Aloo recipe on your blog 🙂 Enjoy cooking! You can subscribe us for more such recipes. My pleasure 🙂 looking forward for more such recipes.